The loss of wildlife and livestock to road traffic in Merrueshi area is alarming. Animals are killed nearly every day by road traffic in the newly built Emali-Loitokitok highway. The problem was less before the new highway. Unfortunately there aren’t many animal-crossing signs along the highway. 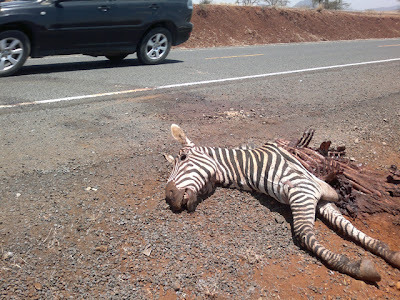 Maasai Simba Camp is looking for financial resources to install animal crossing signs along Emali-Loitokitok highway and reduce the number of animals killed by road traffic every week. Merrueshi is a major wildlife corridor between Amboseli National Park/ Chyulu Hills National Park and Tsavo West Game Reserve. We believe that animal crossing signs will reduce the number of animals killed every week. Let us know if you or someone you know is interested in sponsoring animal sign project in Merrueshi area. 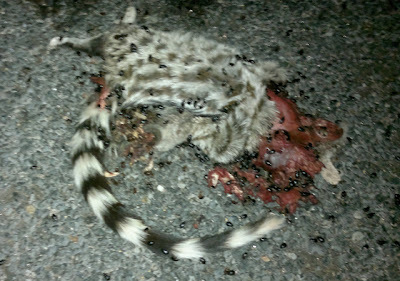 Below are pictures of animals killed by road traffic in Merrueshi area. Some photos are not suitable for children viewing. 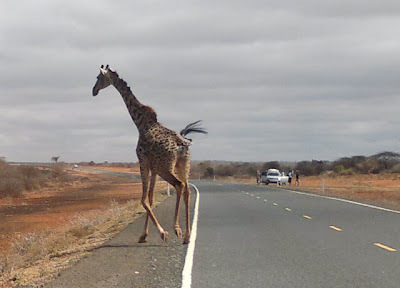 This giraffe barely escaped a speeding matatu with 14 passengers.